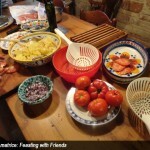 Sooner or later, most of our apartment guests join in a dinner in our Assisi farmhouse. But not all guests pay for their dinner! Ann and Warren did. Why? 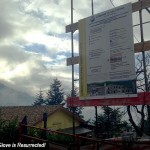 They participated in a benefit amatriciana dinner for earthquake restoration, Read more here. 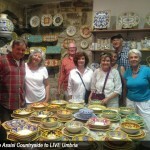 I hope that all of our apartment guests will feel – and live – the passion I have for Umbria. Loi, John and Peggy did…as you can see here. 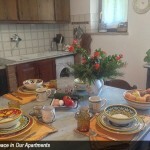 A stay in our Assisi countryside apartments means connecting with “the locals” and truly LIVING Umbria. 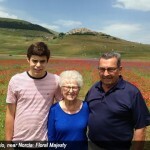 Read about – and see – the memorable stay of California guests. 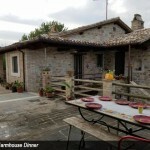 Solidarity for the August 24th earthquake homeless united family, friends and our apartment guests for a benefit feast in our Assisi farmhouse. 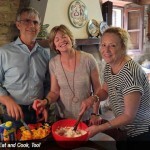 In Assisi, Eat and Cook, Too! 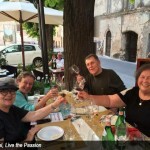 When you’re staying in Assisi, enjoy the good flavors of Umbria as well as the art and history. Come to our farmhouse and let’s cook together! 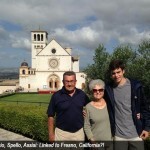 Castelluccio, Spello, Assisi: Linked to Fresno, California?! Castelluccio (near Norcia), Assisi and Spello: all linked to Fresno! Si! Read how. 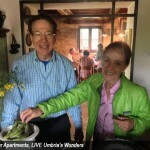 May is the time of festivals and the time of celebration: a celebration of Umbria. Join us! By Jove, Giove is Resurrected!